Simply put, professional home staging is preparing your property for market using your budget and timeframe so that it sells in the quickest amount of time and for the most money possible. Home staging is not decorating or design. Decorating is personal. It’s done for the homeowner. Staging is depersonalizing. It’s done for the unknown buyer. We are expertly trained in the proven techniques which make each space appear larger, brighter and more inviting. We create spaces that are universally appealing to all potential buyers. Any property, whether a starter home or a luxury estate, will benefit from home staging. In down markets, your house will sell faster. In hot markets, your house will sell for more money. We will come to your home to preview the property, inside and out, and will deliver a comprehensive, personalized blueprint which details recommendations that should be done in preparation for the sale of your home. Homeowners can use the consultation report as a checklist to keep them on task and on schedule. You may choose to execute the staging plan we provide on your own or, if you find that you’re unable to complete the staging, we will include a proposal for us to complete the staging portion for you. Contact us to request a Home Staging Consultation. Vacant properties typically take longer to sell than occupied and/or staged properties because buyers have difficulty visualizing what the house will look like with their belongings in it. Vacant spaces are uninviting and are often confusing for potential buyers. Will my furniture fit? Do I have enough furniture? How would I arrange my furniture? What would I do with this room? These are just a few of the questions that buyers have when confronted with vacant spaces. We will set the stage for buyers so that these, and other questions, are never asked. Buyers only know what they see, not the way it’s going to be. With our staging services, buyers will see a home they want to live in. Take a tour of our before and after galleries of vacant home staging projects. The way we live in a home and the way we stage and market a house for sale are two very different things. We work closely with the sellers of occupied houses to depersonalize, declutter and neutralize the entire property so that potential buyers feel right at home the moment they walk through the door. We will use our expertise to advise you on how to prepare your property for the staging project. 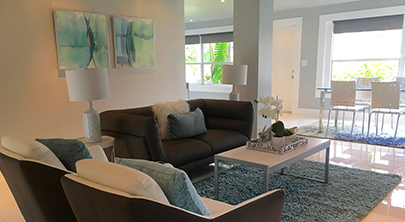 Recommendations include what to keep, what to place into storage, what to move within the home and what, if anything, Premier Home Staging will bring in to supplement and enhance what is already at the property. We are experts in repurposing homeowner’s items and, when necessary, seamlessly blending in pieces from our inventory. We will create an inviting look that will dramatically transform your space and present it to potential buyers in the best possible light. Take a tour of our before and after galleries of occupied home staging projects. We believe strongly in continuing education and make it a priority to keep current on the latest trends so that your new homes are presented to potential buyers as perfectly on trend. 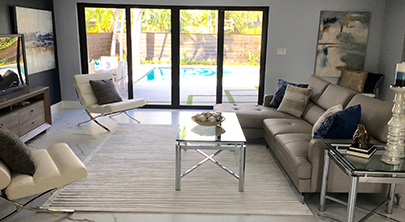 Andi is an expert in accentuating the custom features of builder spec homes and investor rehabs and chooses furnishings and accessories that mirror the sophistication and fine quality of your product. Her eye for detail and expertise in providing the all-important finishing touches will ensure that your custom homes stand out in any market. 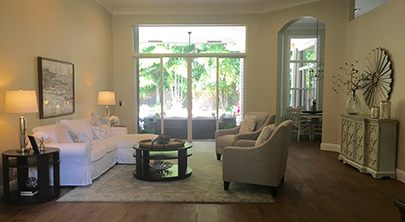 Take a tour of our before and after galleries of spec home staging projects. Perhaps you are not moving but are looking to transform your home into your dream oasis and you’re not sure where to start or how to achieve your desired result. We offer professional guidance to homeowners who want to remake their homes. We will meet with you to discuss your lifestyle, preview your property and develop an action plan to help you reach your goal. We are skilled in paint color selection, proper furniture arrangement, use of color through décor and selection of art and accessories. We also provide personal shopping assistance for an additional cost. Time for mom or dad to move to an assisted living facility or downsize into a smaller home? We offer a variety of services to help transition seniors from one home to the next. Because of the delicate and unique nature of these types of moves, each client situation is evaluated on an individual basis. Our goal is to make the transition process as stress-free as possible and prepare a comfortable environment for the next phase of our client’s life. Decluttering, depersonalizing and neutralizing are the keys to showcasing an occupied property that buyers can picture themselves in. View the photo gallery to see a few samples of Andi’s work staging occupied properties. VACANT DOESN’T MAKE IT. Transforming cold, empty houses into warm, inviting homes is what it takes to make the sale. View the photo gallery to see a few samples of Andi’s work staging vacant properties. Builders and Investors, Andi knows you need to turn properties quickly so you can move onto your next project(s). Her staging plans allow you to do just that. View the photo gallery to see a few samples of Andi’s work staging Builder Spec Homes and Investor Flips of all price ranges. Now that the sale of our townhouse has closed, I want to thank you for all the fabulous work you did to help maximize its presentation. From the beginning, you were so easy to work with, and it was a pleasure to go through the staging process with you. Once the home was staged and on the market, we had a full price contract within about 2 and a half weeks, and the property appraised for that full asking price. I am confident that your staging, combined with our Realtor’s expertise, led to that highly successful result. Thank you! We are most grateful.